The Arkansas Discovery Network’s Planet ‘X’ Mobile Museum was onsite at Sheridan Intermediate School Feb. 9 and 10. The mobile museum is set up to look like the inside of a space station and features nine interactive exhibits designed to engage visitors in engineering skills. Within the mobile museum, students execute assignments on computer aided design, aerodynamic testing and laser beam splitting to gather information about Planet ‘X’. Shona Stroud, 6th grade teacher at SIS, arranged for the mobile museum to visit the school, because her students are currently learning about space, and the nine activities in the station coincide with the 6th grade learning standards. The mobile museum is a free service available to 6th grade classes in schools across the state of Arkansas. The Arkansas Discovery Network, which was initiated in 2006 with funding from the Donald W. Reynolds Foundation, is dedicated to providing the highest quality educational experience to the children, families and teachers of Arkansas. 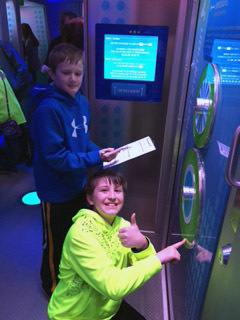 Picture Cutline: Dayne Brown and Jase Brown enjoying one of the stations inside the Planet 'X' Mobile Museum.